For the pdf Files ----> Acrobat. One Wire - Description 1-Wire®. One Wire - Program 1-Wire®. ZIP. Circuits, Programs, & Applications featuring the 8052-BASIC Microcontrolle by Jan Axelson (with chapters available on-line). BASIC GPC® 554 - Short Guide - MCS® BASIC-52 Intel BASIC Interpreter for Philips 80C552 CPU. 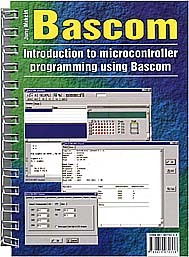 This very usefull "pocket-book" has been dedicated to whom would like to experiment the use of µP and programming the same by using the powerfull and easy to use BASCOM BASIC Compiler. This "pocket-book" has been conceived to allow people, mainly novices, to make the first important steps, and subsequent ones, to the misterious world of 8051 and AVR µP families. Written in easy and explicatory English and equipped with a large number of demo programs, this "pocket-book" leads the reader to the discovery of many different applications. Readers have at their disposal a complete serie of PCBs diagrams which allows to make an experimental cards with 8051 µP so as a Programmer/emulator for 89C2051 ect. For further information please visit our Web Site www.grifo.it or www.grifo.com or contact us directly at our offices. Multidigital site, kit; electronic, etc. I V A R - electronic, automation, etc. GET-51 -Terminal-Emulation fot 8051 ant others. PIC Genius è un tool di sviluppo (Italiano) IDE per microcontrollori PIC.